November | 2006 | Planet Geek test site. Every once in a while I get a good dose of greeniness, and look around my little corner of geekiness and sort of wonder “How much juice is this actually using?” After asking Cat what our monthly electric bill was ($300! ), I decided this question needed a closer look. A month or two ago I had picked up a Kill-a-watt (terrible name, ain’t it?) power monitor. This little gadget plugs into a wall outlet, and tells how much power is being used by things drawing through it. Today I jacked it into the single outlet that feeds my nest o machines, and powered things up. The meter dutifully reported the load as things came online, and steadied out at about 280 watts. All in all, that’s not too bad for 3 computers, 3 lamps, and associated peripherals, but I was curious how that load was distributed. What was actually pulling all that juice? Unsurprisingly, the single largest draw is yawl, my 2.2gig P4 Linux box. It accounted for about 85watts of power (without monitor). The second biggest draw was, oddly enough, lights. I have 2 compact flourescent desk lamps (about 15watts each), and a single halogen desk lamp (35 watts). I knew the halogen light was pretty dreadful, and this pretty much confirms it. That chalks another 65 or so watts. Which leaves me with 140 unaccounted for. Well, the two laptops were about 30 watts each (pretty nice considering the horsepower in clipper and hunter). Down to 80 now. This last chunk was pretty much the combined load of the LCD monitors, various chargers and other desktop doodads, a pair of external USB drives, and the like. So what’s to be done about it? Well, I’ve been considering moving to LED based lights for a while. They’re small, cool, draw -very- little power, but have the current drawback of being ridiculously expensive. A single bulb equivelent to a 100 watt incandescent bulb would cost around $52. The equivelent compact flourescent bulb costs around $5. The advantage to using LED is the current draw is miniscule. For the equivelent amount of light, the bulb would only consume about 2watts of power, AND have the advantage of being dimmable – something impossible with CF bulbs. If I replaced my 3 desktop lamps with LED lamps, I could cut my power consumption by a third. I also have 4 other lamps in the room that could be replaced as well. The question is, is it worth it? I’m still puzzling this one out. If anyone has suggestions for good sources for inexpensive LED fixtures and lamps, please let me know! In all my driving around I have a lot of time to listen to XM Radio in the techno-van. Much of the time I spend listening to the various comedy channels – sort of non stop standup. It’s pretty interesting, but one unexpected delight keeps coming up. For those that know this series, you can’t help but smile and hear the intro clearly when reading those words. Even after almost 40 years, it’s still a hoot to listen to, and I have to thank the anonymous genius at XM Radio who managed to get this show back on the air. Some further details about the show are here. Thanks XM! In many ways, working with clipper has been quite a joy. Everything works well, I only have to reboot once every 2-3 days (hey for Windows, that’s pretty good), and it’s pretty zippy. But part of my job includes teleconferences every morning, which requires a headset. Headsets need to be plugged into the Mic and Speaker jacks. The jacks should NOT be color coded. Basic black works great for everything! I now know intuitively that the Microphone jack is toward the ‘back’ of the laptop. The jacks are NOT duplicated on the docking station. This is just daft. The docking station is supposed to be used to dock and undock the laptop with a minimum of hassle. NOW I have to plug and unplug my headphones -everytime- I dock or undock the laptop. And, of course, I situated the laptop to the -right- of my monitor stand, so it’s in the way whenever I need to do this. I blame Dell for that one too, while I’m at it. Yesterday we all went over to Steph and Dwight and Sarah‘s house for their (now traditional) “Day after thanksgiving hang out and share leftovers” day. It ended up being an outstanding afternoon of socializing, food, kids, chat, and general friend-connectedness. 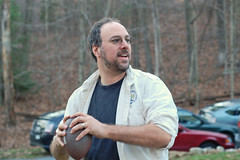 Part of the fun was being outside (after all the rain we’ve had) and playing football with the kids. John joined in as well, and we kept Zach, Ian, Andy, Mishka, and Alexei well entertained for an hour or two. Diana took this shot while we were tossing the ball around. I really enjoyed having the time to spend non-business time with my future neighbors and other friends. It was just what the Dr ordered. 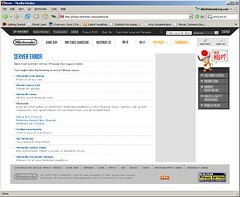 Perhaps today wasn’t a good day to try and get Nintendo DS information off nintendo.com. So yesterday we got notice that the new futon we had bought had arrived. It was only 5 minutes away by car, so we quickly scampered over to pick it up. Since I was taking apart the bed anyway, I thought it would be a good time to follow through with a project I had been thinking about. While I liked the whole futon concept, I was really done with the “bed on the ground” thing, and wanted something I could actively sit on the side of. 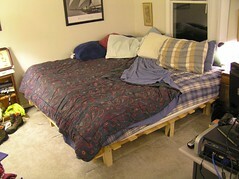 Mattress boxsprings and frames seemed silly – I already had a bed, I just needed to raise it up. On with the power tools! The first step was to make the trifold kingsized frame rigid. It wouldn’t be sitting flat on the ground anymore, so it needed a way to support itself. Adding 3 2×3 stringers along the underside of the frame did that. Next I needed to raise the whole setup. I added 9 posts to the bottom by connecting a 6″ piece of 2×3 to a 10″ 2×3, in a sort of ‘shelf’ arrangement. The bedframe sites on the smaller piece, and attaches to the side of the longer piece with a pair of heavy wood screws. With help from a visiting friend, we assembled the entire thing in about an hour. After flipping it over and putting the mattress back on top, the entire arrangement is now easily flush with the window and sitting on it is quite comfortable. i can even see the TV while folks are playing games or hanging out. Hooray! Oh, and a new futon mattress after being on the same one for 6 years? Priceless.